Learn with top-qualified kite-surfing teachers! If you want to learn kite-surfing on Mallorca, our kite-surfing school is the right place for you! We have top-qualified English-speaking kite-surfing teachers and we offer the greatest selection of new kites and boards every year. 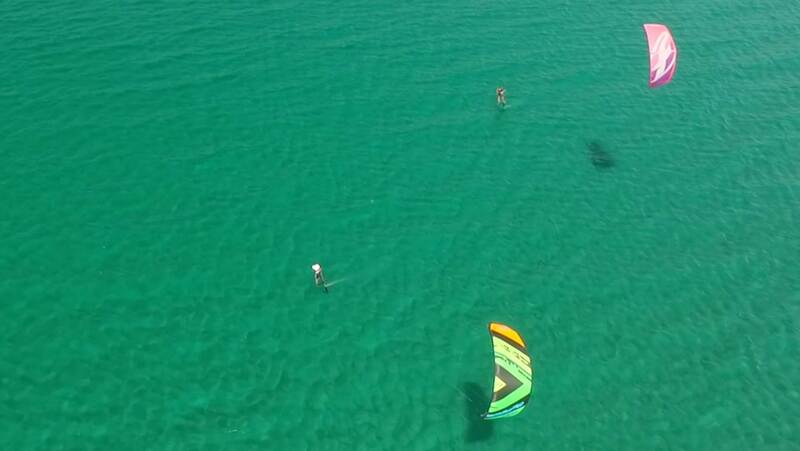 Go get your kite-surfing course on Mallorca now! We offer inexpensive group courses from 45 € / hour for beginners and advanced learners weekly as well as individual lessons and trial courses. Stand Up Paddling (SUP) is the fastest growing trend sport. Discover Mallorca from a new perspective: Our SUP Adventure Tour promises great fun for big and small! Conveniently rent Kites, SUPs, neoprene wetsuits, and the entire equipment. Our material is naturally well maintained. And if you have a problem, we’ll be on the spot immediately! We teach in the bays of Pollensa, Alcudia und Palma. We are thus especially flexible and depending on the wind direction, we (almost) always have the ideal conditions for you! Here, we show you a few images from our kite-surfing school on Mallorca, the 3 kite spots, our experienced team, and the SUP tours along the unspoilt coastline. Have fun looking at them! What does one have to keep in mind when kite-surfing as a beginner? Do I need a lot of strength? We answer your most important questions relating to kite-surfing on Mallorca. All beginnings are easy! You will learn the first steps for kite-surfing with us in a completely relaxed way... In this course, we will convey to you the basic knowledge of kite-surfing in the perfect setting. Following this beginners’ course, we will only be content, if you can continue to practice alone in a safe and happy manner. In order to achieve the best possible success and progress and to ensure your safety, our courses will be taught in coordinated small teams. OUR STUDENTS WILL ALSO RECEIVE A COURSE IN SELF-RESCUE! Anyone who has already done a beginners or trial kite course with us or elsewhere, is just right here in our advanced course. Following an assessment test, we will continue the training with the water start. Now, you will also have the unforgettable experience of accomplishing your first few meters with the kite, manage to keep upwind direction, and to make your first tack! Unforgettable! You are already a kiter, but you are still missing the certain knowhow and training? With us you can reach the next level of the kite sport with professional instructions and lots of fun! Here on Mallorca, we kite on a really high level and we will teach you the latest tricks such as switching, jibe into switch, jumps, transitions, flips, kite loops, turnings, unhooked tricks such as Railley, S-Bend and even handle-pass tricks. In case you want an individual kite lesson exactly aligned to your skills? Then you are definitely right with us! We will also teach you intensive private lessons! No matter if in the bay of Pollenca, in Palma or even somewhere else in Mallorca, we are happy to hear from you! Our lessons are all according to the guidelines of the IKO (biggest international kitesurfing organization). At the end of every course we will provide you with an IKO- license which will allow you to rent kitesurfing equipment all over the world or to continue kiting independently. On request we can also provide you with the VDWS license together with the corresponding VDWWS book. You can imagine this as being your logbook in which all your kiting lessons can be listed.